The Global Volcanism Program has no activity reports for Aucanquilcha. The Global Volcanism Program has no Weekly Reports available for Aucanquilcha. The Global Volcanism Program has no Bulletin Reports available for Aucanquilcha. The world's highest permanent human habitation is situated below a sulfur mine in the summit region of Cerro Aucanquilcha, one the largest volcanoes of northern Chile. Several distinct cones are located along a 10-km-long, E-W ridge that forms the broad summit. A Pleistocene debris-avalanche deposit is a prominent feature on the lower NW flank. Extensive Pleistocene glacial moraines surround the stratovolcano, but postglacial lava flows overlie these moraines on the upper southern flanks (de Silva and Francis, 1991). Wörner et al. (2000) obtained surprisingly old Potassium-Argon dates of 400,000 to 780,000 years from the youngest flows on the NE and SW flanks, and eruptive activity appears to have ended during the late Pleistocene. It presently displays fumarolic activity. Francis P W, Wells G L, 1988. Landsat thematic mapper observations of debris avalanche deposits in the central Andes. Bull Volcanol, 50: 258-278. Klemetti E W, Grunder A L, 2008. Volcanic evolution of Volcan Aucanquilcha: a long-lived dacite volcano in the Central Andes of northern Chile. Bull Volcanol, 70: 633-650. Worner G, Hammerschmidt K, Henjes-Kunst F, Lezaun J, Wilke H, 2000. Geochronology (40Ar/39Ar, K-Ar and He-exposure ages) of Cenozoic magmatic rocks from Northern Chile (18-22° S): implications for magmatism and tectonic evolution of the central Andes. Rev Geol Chile, 27: 205-240. The Global Volcanism Program is not aware of any Holocene eruptions from Aucanquilcha. 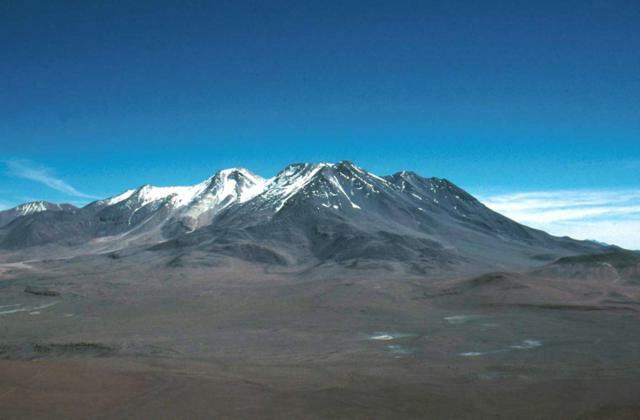 If this volcano has had large eruptions (VEI >= 4) prior to 10,000 years ago, information might be found on the Aucanquilcha page in the LaMEVE (Large Magnitude Explosive Volcanic Eruptions) database, a part of the Volcano Global Risk Identification and Analysis Project (VOGRIPA). There is no Deformation History data available for Aucanquilcha. There is no Emissions History data available for Aucanquilcha. The Global Volcanism Program has no photographs available for Aucanquilcha. There are no samples for Aucanquilcha in the Smithsonian's NMNH Department of Mineral Sciences Rock and Ore collection. Large Eruptions of Aucanquilcha Information about large Quaternary eruptions (VEI >= 4) is cataloged in the Large Magnitude Explosive Volcanic Eruptions (LaMEVE) database of the Volcano Global Risk Identification and Analysis Project (VOGRIPA).